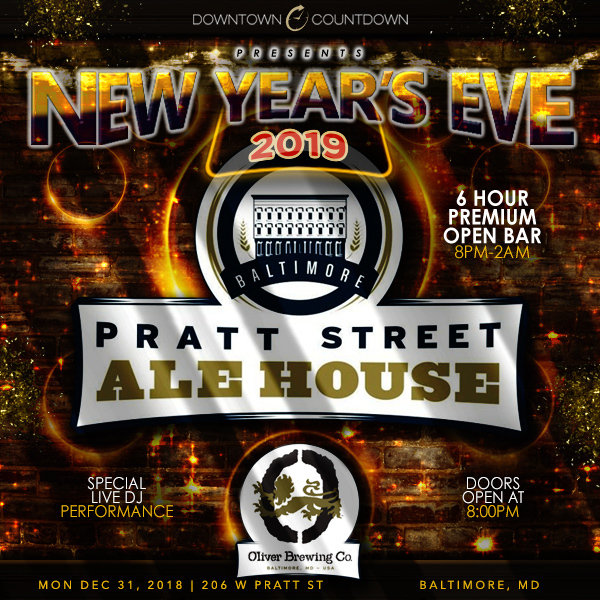 Gather your crew this New Year’s Eve at the Pratt Street Ale House, Baltimore’s trendiest microbrewery that’s hosting this year’s ultimate NYE party. Boasting premium amenities and the city’s coolest revelers, this event promises to radiate the excitement of New Year’s. With a six-hour open bar and the Ale House’s charming interiors, this party is your ticket to a NYE that rises above the rest. As you walk through the Pratt Street Ale House’s quaint entrance, you’ll be immersed in the sounds of one of Baltimore’s best DJs spinning the year’s hottest Top 40, hip hop, and house tracks. Indulge in the complimentary early evening bites, before soaking up the six-hour premium open bar. With tons of brews on offer, you’ll have plenty of party time to sample all of these delights. Toast to a new beginning with the live midnight countdown, offered with the complimentary glass of prosecco/champagne. Looking to party like royalty? Choose a VIP package for the luxe experience, offering perks like reserved seating. You’ve seen the Pratt Street Ale House’s blue exterior commanding attention in Downtown Baltimore, but you’ve never seen this local haunt quite like this. Ornate gold columns greet revelers upon entry, before the exposed brick interiors provide neighborhood charm. Endless good times and cheerful energy are always on tap at Pratt Street Ale House – and the party vibes are taken to a whole new level on NYE. Don’t miss your chance to ring in the New Year at this historic haunt – at Pratt Street Ale House, NYE will be yours to remember.